Stephen “tWitch” Boss Announces He’s Been Cast in Magic Mike XXL — But There’s a Catch! Yet another hunk as been added to the cast of Magic Mike XXL! 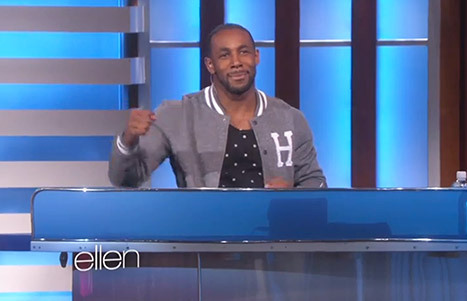 So You Think You Can Dance pro and Ellen DeGeneres Show DJ Stephen "tWitch" Boss announced on the talk show on Wednesday, Oct. 8, that he&apos;s been added to the cast of the stripping sequel. "I have very, very, very exciting news," tWitch told DeGeneres. "I met with Channing Tatum and he asked me to join the cast of Magic Mike XXL!" So is tWitch nervous to bare it all alongside Tatum, Joe Manganiello, Matt Bomer, and more of Hollywood&apos;s hottest hunks? "I don&apos;t mind wearing less," he said. "But I have to get waxed from neck to toe. I&apos;m really nervous about that. I didn&apos;t know that&apos;s what I was signing up for." In true DeGeneres fashion, the comedian promised the dancer, "I&apos;ll sit with you while you get waxed…because I love you and also I&apos;ll bring a camera because it&apos;ll be good TV." Watch their cute exchange above!